Business Wire: CMOSIS and TowerJazz announced 12MP CMV12000 featuring global shutter and a frame rate of 300 fps, said to be best in-class performance. The off-the-shelf image sensor is manufactured in TowerJazz’s Fab-2 in Migdal Haemek, Israel, using its advanced 0.18 µm specialty CIS process. 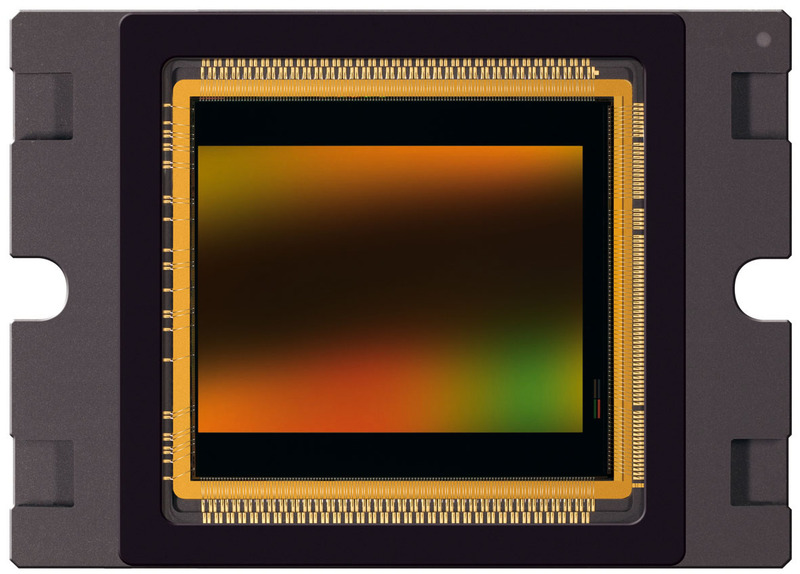 The sensor features 5.5 x 5.5 µm pixels laid out in 4096 x 3072 matrix resembling the APS-C format. CMV12000 offers a DR of 60 dB, extendable to 90 dB through several HDR operation modes. The sensor pixels have a very low parasitic light sensitivity (1:50,000) enabling high efficiency global shutter operation. One of the unique features of CMV12000 is the novel pixel structure, which combines pipelined global shutter operation with CDS. This technique yields an low noise level below 13 e- and a full well of 13,500 electrons. The global shutter CDS also significantly reduces the sensor's FPN. CMV12000’s on-chip ADC can be operated at 8-bit, 10-bit or 12-bit resolution. In the faster 10-bit mode, 300 full frames per second are acquired. At 12-bit, CMV12000 still realizes a frame rate of 180 fps. The sensor's advanced architecture allows for row windowing and row sub-sampling. Up to 32 separate partial windows can be defined for an accelerated readout. Averaging several pixels raises these frame rates and increases the dynamic range. 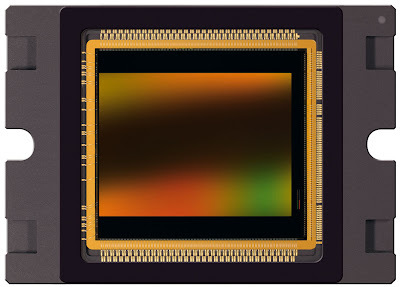 “By combining our worldwide recognized leadership in CMOS sensors and pixel technology with CMOSIS’ many years of experience in CMOS image sensor design, we are equipped to meet the market’s demanding requirements for leading-edge performance, advanced features and reduced die size and price. Together, we are well-positioned to win a significant share of future industrial and professional CMOS image sensor markets,” said Avi Strum, VP and GM of TowerJazz’s Specialty Business Unit. The new CMOS sensor is suited for a broad range of industrial, movie and TV, traffic monitoring and motion control applications. The Total Addressable Market for industrial sensors is estimated at $750M, out of which the machine vision sensor market is estimated at $200M, according to a report titled, “The Future of Image Sensors Market and Technology Forecasts to 2014,” by Roy Szweda. Update: As written in comments, the sensor is based on 8T pixel to realize a high-quality fully pipelined global shutter with low parasitic light sensitivity. All 8 transistors together with two storage caps are squeezed into 5.5um FSI pixel in 0.18um process - the pixel layout must be a masterpiece! I dont understand how you can do a global shutter CDS in 5x5u pixel. You need a 'reasonable' capacitor to store your signal with a good SNR. And how do you read the reset signal? the framerate is high and the inter-frame time is short. So you don't need a large cap to store the signal. For example, the photodiode dark current is seen from outside as 50mV/s in a normal CMOS process. If the frame rate is 300fps, the necessary storage time is 3ms, translating into DC signal => 150uV. But if you read the image out at low speed, you could have some problem. But anyway in such camera all the peripheric electronics is tailed to support 3ms frame time, so the readout duration is always 3ms even at lower frame rate. @ "You need a 'reasonable' capacitor to store your signal with a good SNR. And how do you read the reset signal?" I'd guess the pixel is not a regular 4T pixel and has some means to store the charge, possibly with fully pinnable storage. are the microlens on the pixels ? @ "So you don't need a large cap to store the signal. For example, the photodiode dark current is seen from outside as 50mV/s in a normal CMOS process. If the frame rate is 300fps, the necessary storage time is 3ms, translating into DC signal => 150uV"
I do not think it is that low! The big issue is the "cds". Ok, you store your signal 3ms at your small cap, but when do you read out the reset noise? 2 sourse followers? A lot of voltage drop! Could you still get any signal out of the pixel? I feel that DR is low and a lot of saturation in the sample images. A CCD of 60dB DR gives much better image. Why ? "DR is low" -> I guess it is hard to judge from an image taken from a pdf slide - one should see the original file... If the given values of 13e- over 13500 FWC are correct, than 60dB it is. 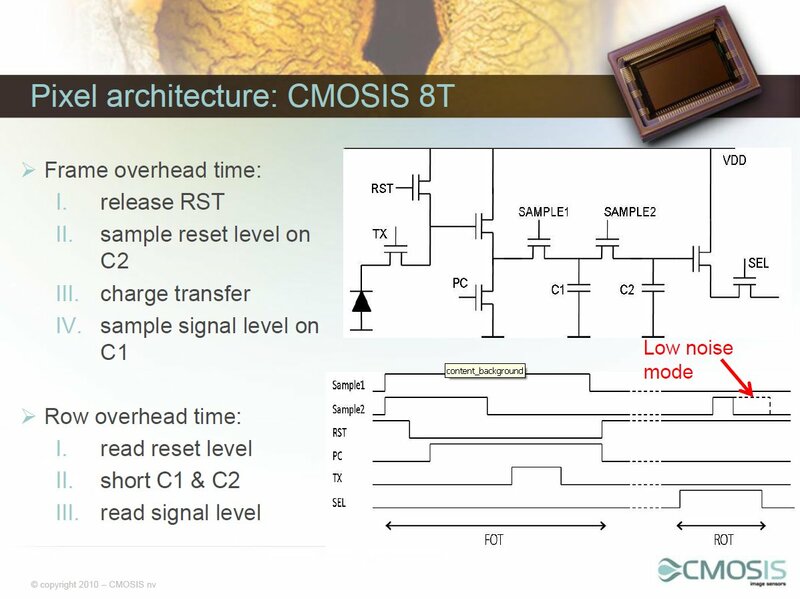 I am curious though how many outputs this sensor has, and what kind of ADC - if they were column ADC's as in the other CMOSIS CMV products, they would need to be quite fast. But what really caught my eye is the dark-signal rate. Wow! Nd/sec = 22/0.07 = 314 e-/sec at room temp. So using full pixel area, that's 0.166 nA/cm^2 at room temp. Seems VERY high to me. As to the microlens question, I know their other two CMV products (2k & 4k) are offered in "monochrome" both w/ or w/o microlenses, or in color (Bayer) w/ microlenses. With 8T, one wonders how small the pixel aperture & PDs are, and what the angle response looks like? Dark-signal seems high indeed, but at these FPS rather un-important. At 300 fps, this would be just 1 e-. In the datasheet of the CMV2000/4000 it is stated that the pixels have an optical fillfactor without µlens of 42%. This sounds quite good; throw a good µlens over that and voila. Thanks! (I only have seen the short spec, which doesn't show fill factor.) Does it shown angle response? Agree about dark signal at such high frame rates. Could be problem at slow speed/long integration time captures and at higher temps. Wonder about dark signal at higher temps, say, 60C? If it doubles, say, every 6 C, then it could be nearly 60X higher. I guess that they use drain/source with gate=Vdd storage structure. With 1.8V NMOS, you can get 10fF/um2 but the price to pay is the high dark current rate. am I right :)? I think the main problem here is the charge redistribution of the switches. Once you turn off the switch the charge contained in the channel is released to the capacitor decreasing the voltage on it. With small caps that is a big problem. Hard to believe those noise performance numbers. From slide #12 in CMOSIS' presentation, one can deduce the caps should be ~ 18fF, which seems realistically possible. I guess the voltage drop is compensated by applying gain immediately in the columns. It is interesting that in the dark the noise is this circuit is just the SF RTS or 1/f noise plus the sampling stage kTC noise. The front end kTC noise goes to zero, not because of CDS but because the FD does not get any new charge when being reset in the dark due to the soft reset phenomena. In a 3T device soft reset leads to lag-like behavior but not with 4T timing as in this case. Thus, in the dark, the CDS stage is its own worst enemy when it comes to noise. the noise electron number is refered to input. With 2fF FD, the 13e noise gives 1mV RMS. It's not a small voltage anyway. Eric, if we disable the CDS (for characterisation), we measure kTC noise of the floating diffusion. It is lower in soft reset but not zero. This is nicely cancelled out by the CDS (just like other effects of soft resets or supply variations in hard reset). We operate it typically in hard reset. It doesn't make much difference. By the way: "hyperactive pixel", that's a nice name. Layout is a piece of art, indeed. We have some artists in the company for that. @ "I guess the voltage drop is compensated by applying gain immediately in the columns"
Thanks Guy. Indeed, even soft reset can give kTC noise-like behavior under the right timing as Pain et al. at JPL pointed out 10 or 12 years ago. Hope the product generates some good revenue for CMOSIS and its partners. How come this sensor is not shown on the CMOSIS website? Did they ever made it? 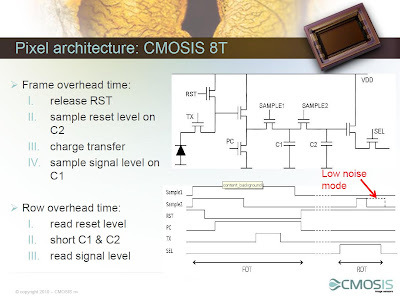 Press Release: "CMOSIS granted Patent US 8,569,671 for 8 transistor (8T) global shutter." Google Patents: "Pixel array capable of performing pipelined global shutter operation including a first and second buffer amplifier US 8569671 B2"